Even if ‘Summer’ puts in a ‘meh’ performance ‘Scruffy August’ on St Helena can always be relied upon to do it’s dastardly deed. 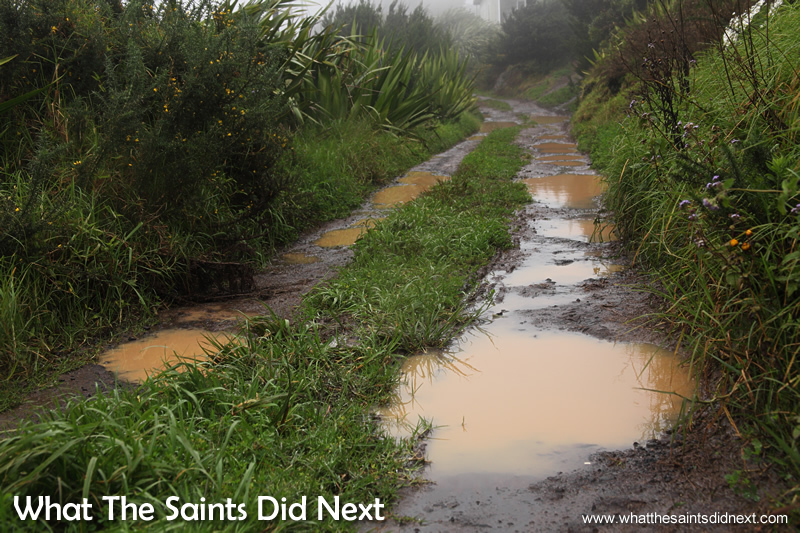 It’s so called ‘scruffy’ because of the rain, mud, wind and general lack of sunshine during the month of August tailing the end of a southern hemisphere winter. Scruffy because it’s neigh impossible to step outside without mud sticking to your shoes, not be spat on by rain and try as you might to protect that hairstyle, the wind will give it a once over. Scruffy because it’s a challenge to dry laundry, surfaces grow a layer of mould and the cold brings an onslaught of runny noses. Nothing is left clean and dry. Yes it’s miserable and so tempting to snuggle under the duvet all day. Hutts Gate looming out of the misty weather. 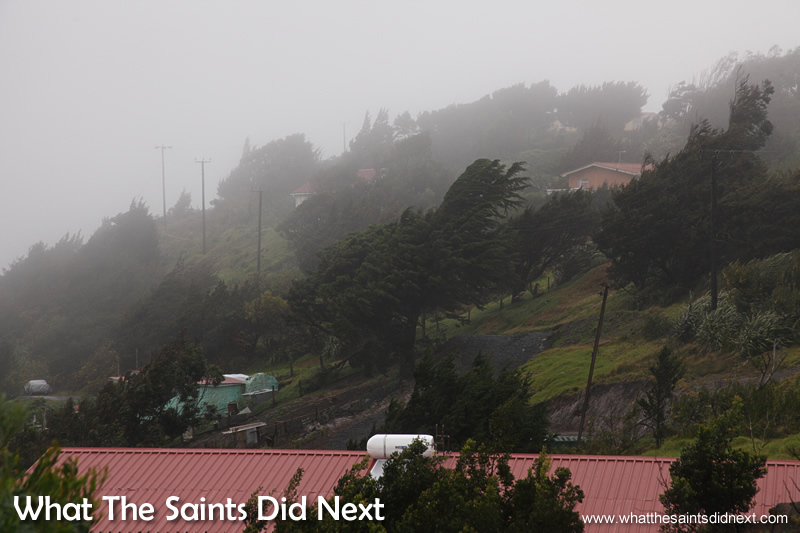 St Helena winter weather – No water shortages at the moment! 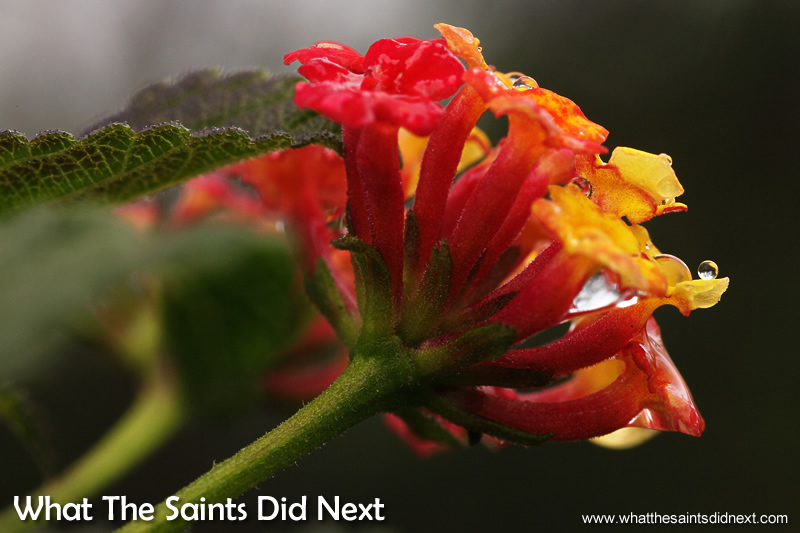 There is beauty and colour in St Helena’s winter weather, but you have to look closely. Flowering lantana bushes in Longwood. 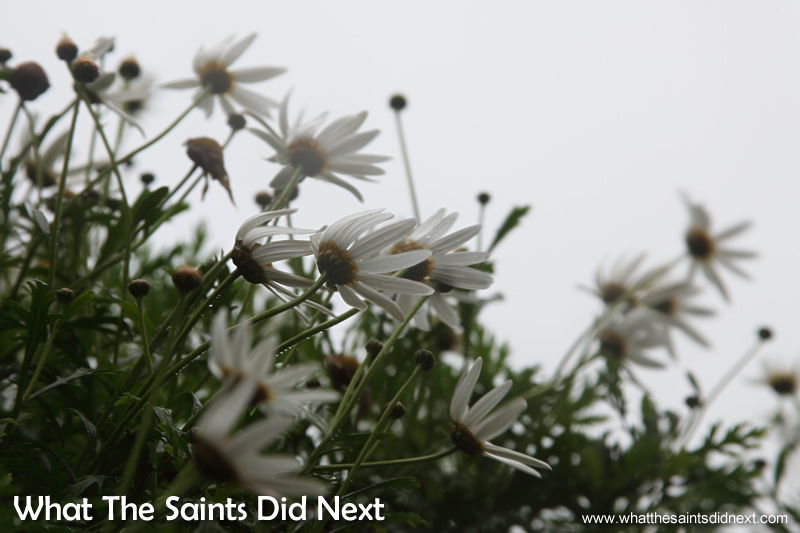 Click here for more flowers of St Helena. The windswept slopes along Longwood Road. Yes, it’s as miserable as it looks! 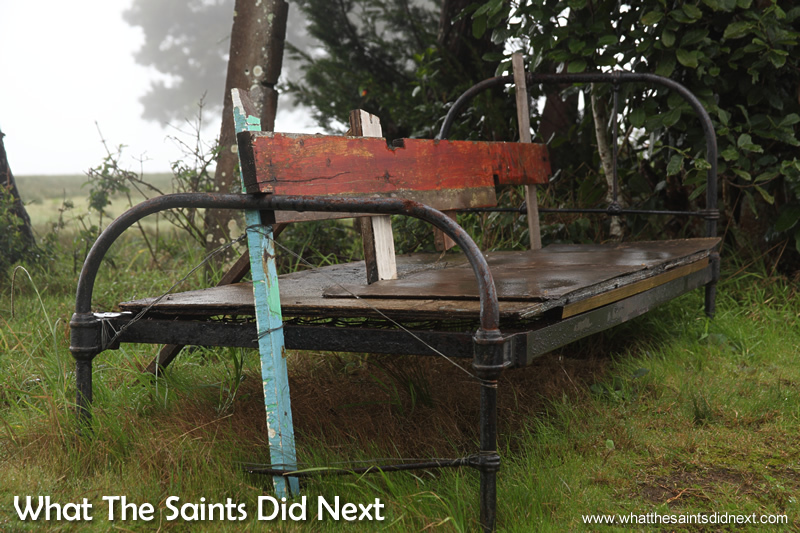 An improvised bench; no takers in the rain. Playground not so busy on Longwood Green. Whose idea was it to come out in this? But as the saying goes, ‘if you can’t beat ‘em, join ‘em.’ So we cast off the duvet, throw on multiple layers and venture out towards Longwood to photograph just how gloomy the weather is. The sky an opaque white shows no a hint of sunshine, the tarmac’s slick and leaves are dripping wet. A low lying fog gives the landscape the appearance of a washed-out watercolour painting. It’s difficult keeping the camera dry even in a light drizzle so a plastic carrier bag is hastily employed for protection. Cars slosh by with windows wound up and wipers set on a constant swipe. At Hutts Gate trees bend, submitting to the wind’s billowing force. Longwood Avenue road disappears into mist, the visibility is bad. Longwood Gate just around the corner. 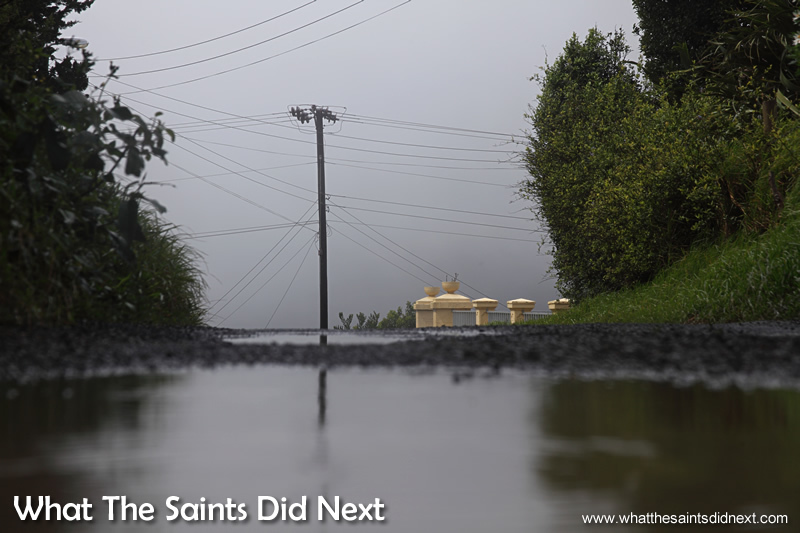 St Helena winter weather – Not much hope keeping the car clean on this road. 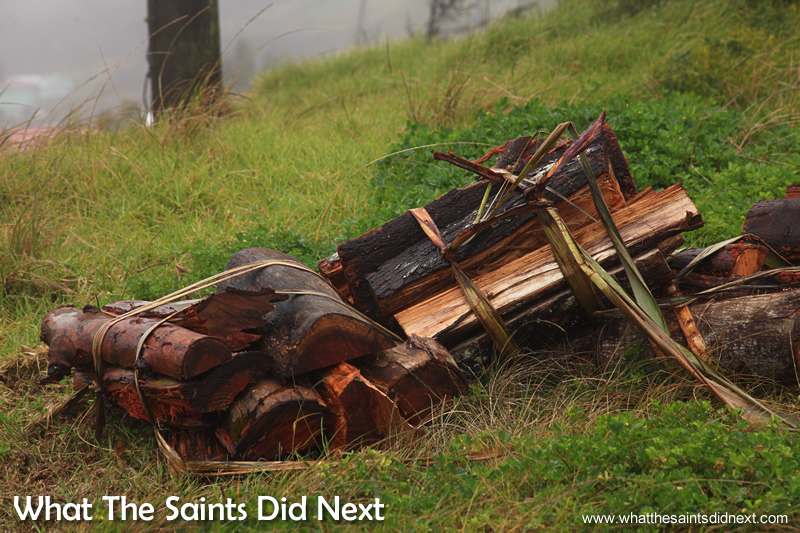 This firewood is going to take some time to dry out. 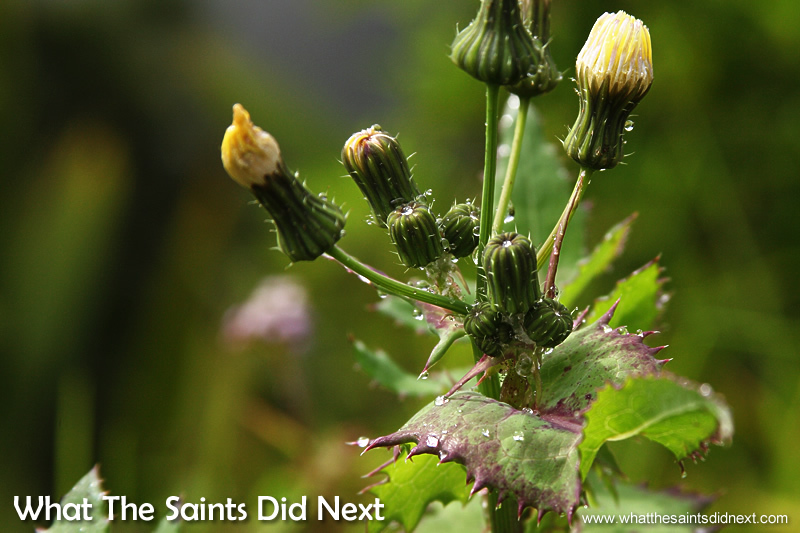 Wind battered daisies on the roadsides through Longwood. 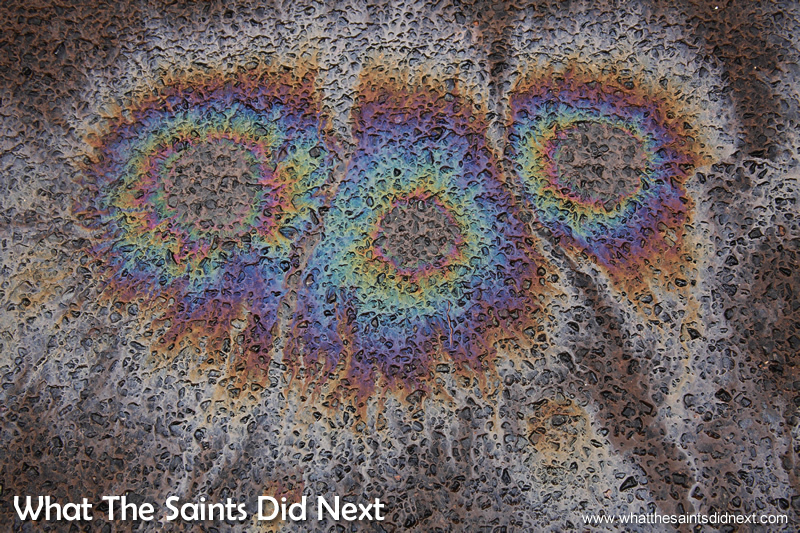 Rainbow street ‘art’ created by leaky car transmissions. Longwood Golf Club, 7th green. No golf today. 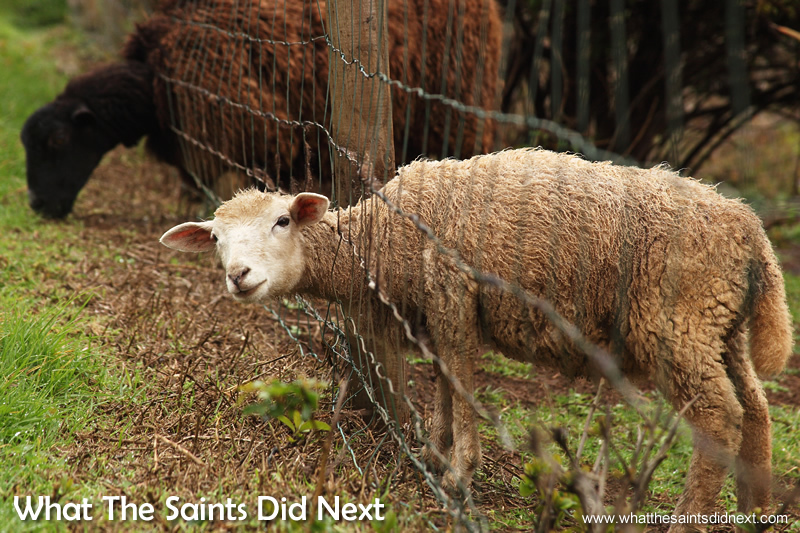 Keeping the St Helena golf course grass cut. 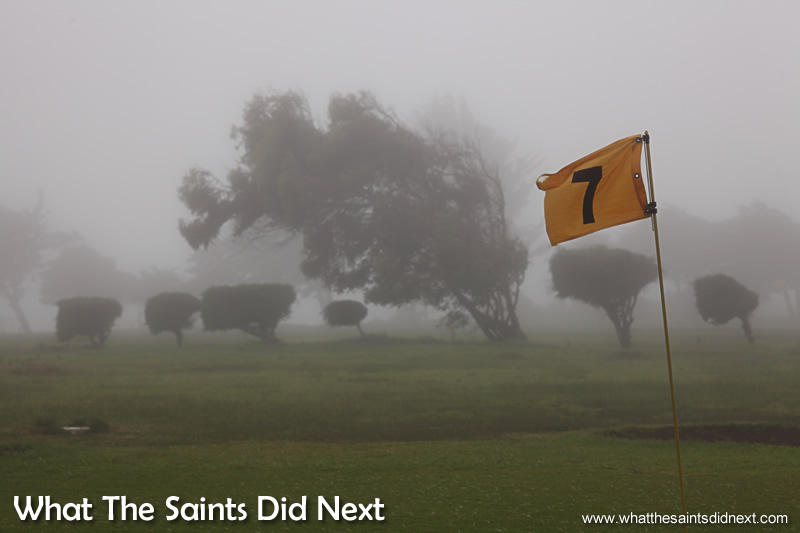 St Helena’s only golf course is blanketed in fog; tethered goats graze along the fairway as a natural form of grass management. Here player skills are tested on avoiding the animals and treading carefully to avoid droppings. 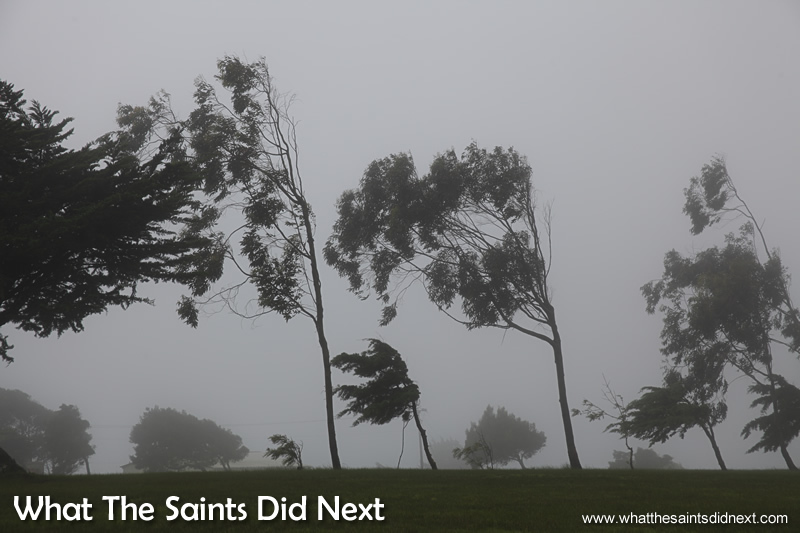 This weather even defeated Napoleon Bonaparte who suffered chills and lamented the island’s damp climate. 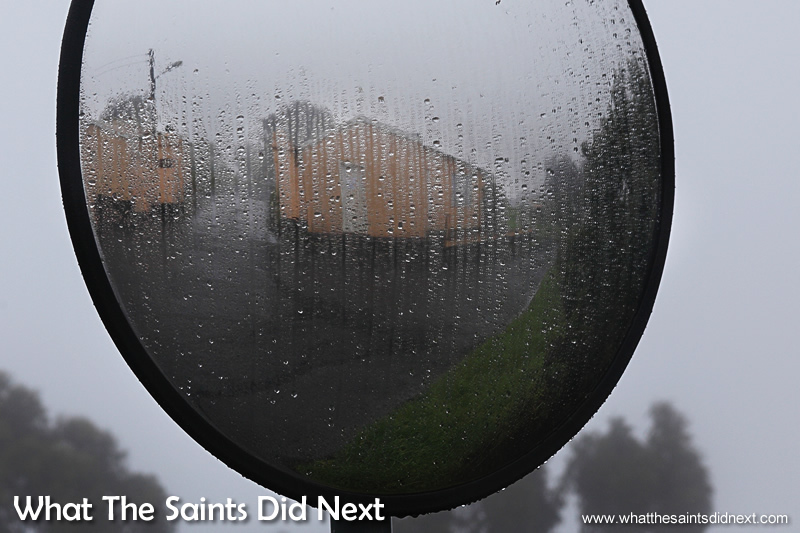 Temperatures on St Helena can dip as low as 10 degrees Celsius. 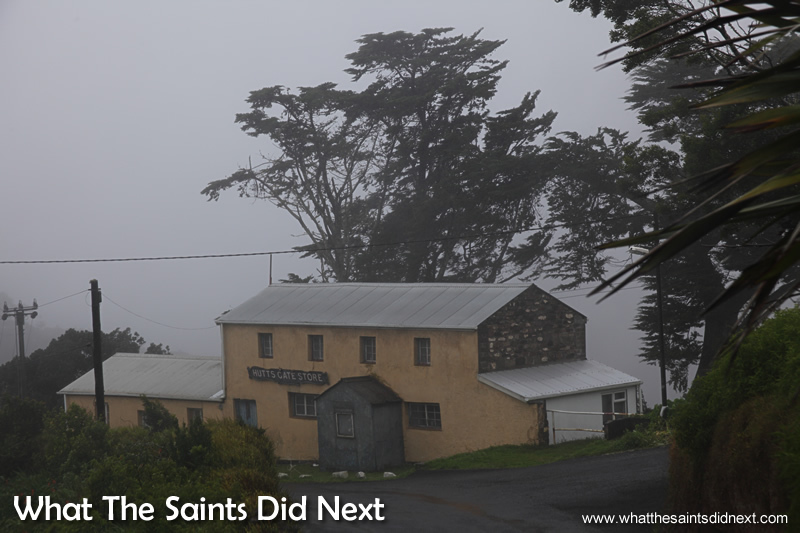 This might sound ‘balmy’ to our friends overseas but for whatever reason, buildings here on St Helena are not equipped with insulation or internal heating (bar those few with wood stoves) so we feel the bite. The view driving along Longwood Road. Taking shelter inside the Rose & Crown. Scruffy August, just showing off now! But after all my grumbling, there is a beauty to Scruffy August in a morbid, melancholy sort of way. 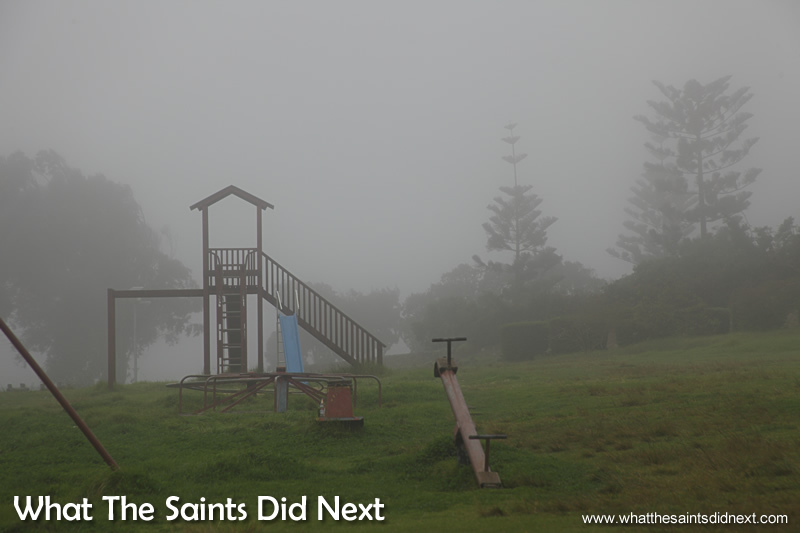 Especially when the fog momentarily clears to reveal views that makes St Helena one of most stunning places we’ve ever seen. There is always flora that can stand up to the winter weather. Saint Helena is still beautiful even in scruffy August. Really? What’s wrong with you Marteka! 🙂 Bring on the sun! Great pictures ………thats why i love my rayburner !!!! Lucky and sensible you Sandra with the rayburner! They really do warm up a home. It seems even more wonderful in the winter!! I love this island. It definitely resembles a winter wonderland minus the snow! Thanks JJJ. Hope you get nice and toasty next to the stove! 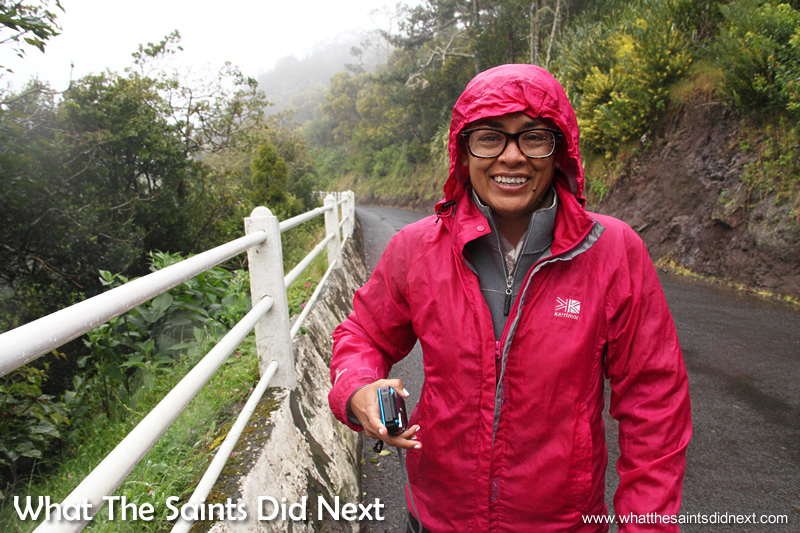 The weather never kept us indoors, too much to see and do on the island. And when the sun came out there was a passing police car and our rain gear was taken to the station and hung up to dry. What a beautiful Island with beautiful people. 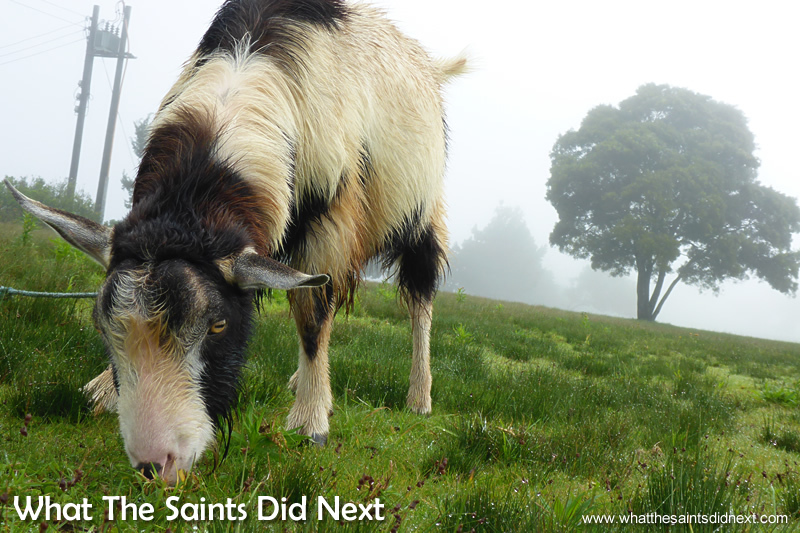 Yes we’d expect a little rain and mud would not hamper your exploration efforts Billy! Funny story about the police car – thanks for sharing. What a beautiful Island it is and so interesting for the visitor.We have really happy memories of the times we spent exploring the Island .. a paradise in itself. 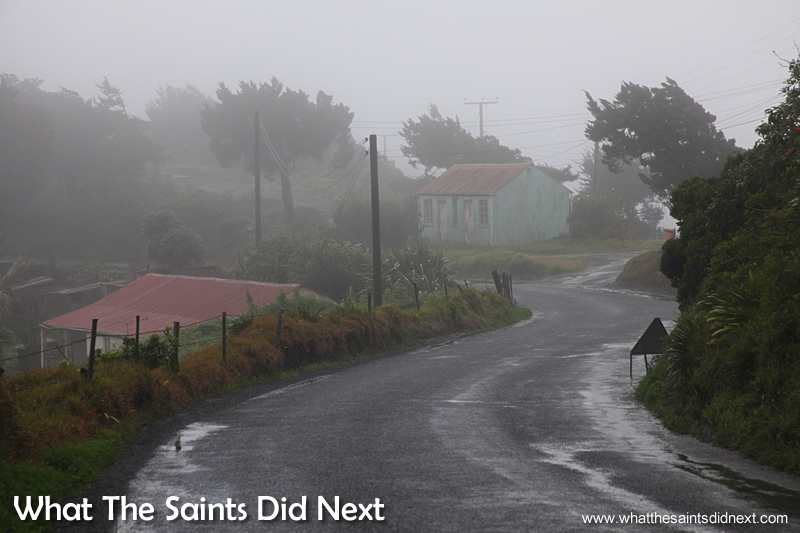 We agree Neville, St Helena is such a beautiful island – even when covered in mist. The weather might not be too good but it is still a magical place!!! Yes magical indeed Sheila – actually as a young girl I thought it the perfect setting for fairies and goblins!